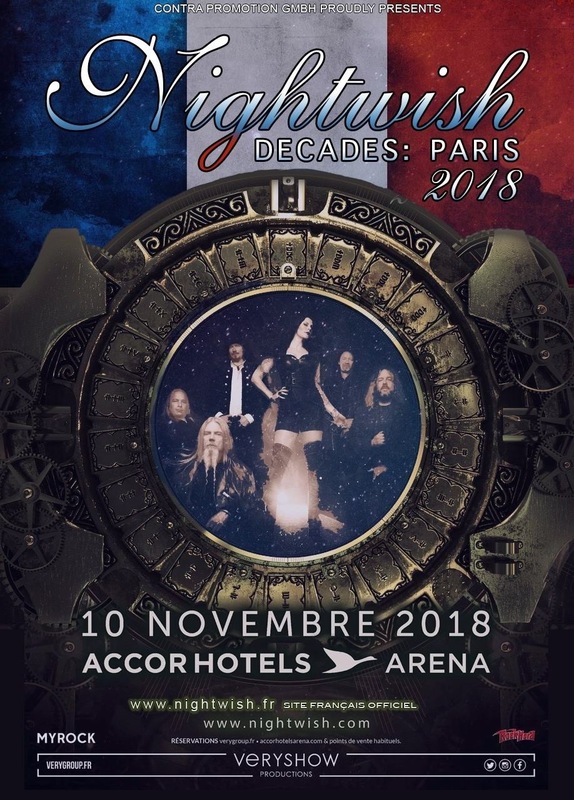 Tonight’s gig was Nightwish with support from Beast in Black, at the Accor hotels arena in Paris – just next door to Bercy station. The first thing I noticed is that the French fans were very keen – they were queuing outside in the rain long before the doors opened, and by the time I got into the arena shortly before Beast in Blcak, the place was packed. When I say packed, I really mean it – at any UK arena gig I’ve been to, arriving before the support act means you can get pretty close to the front without much effort but tonight the floor standing area was so full I was two thirds of the way back from the stage. Once Beast in Black started, it was clear the fans don’t just turn up early – they’re there to really have a good night and gave the band the sort of reception most places reserve for the headliner. Beast in black were formed by Anton Kabanen after he left Battle Beast in 2015. They released their debut album (Berzerker) at the end of last year which was a great debut, so tonight’s set is taken from that album. It’s a great set – catchy power metal songs that really go down well with the crowd and really gets them warmed up ready for Nightwish. I’m looking forward to seeing Beast in black again soon. Then it was time for Nightwish. I’d seen a couple of their festival shows earlier in the year but this was the first of their concerts I’d seen on this tour. The concerts are pretty much the same show as the festivals but with a longer setlist. Unsurprisingly most of the songs played tonight feature on the “Decades” compilation album, but there are half a dozen songs in tonight’s setlist that arent on the album. The show kicked off with Troy Donockley playing an instrumental version of “Swanheart” before the rest of the band joined him and they turned up the volume and pace with “Dark chest of wonder”. It’s a spectactular show – lots of pyro and flames, and video screens not just at the back but in front of the risers so the drum kit appears to be floating. Throw in a couple of screens with closeups of band members and the whole thing looks fantastic whether you’re close to the stage or much further back in the arena. The setlist too is excellent – lots of popular songs but also some less well known songs from the archives, so it’s a really good set that covers the whole history of the band. It was interesting to see which songs went down best with the crowd – the clear winners were the songs from the “Imaginaerum” album (“I want my tears back”, “Turn loose the mermaids” and “Last ride of the day”). The band are at the top of their live game and put in great performances. Floor does a great job with the material both old and new and is a great performer. On one song I did think her voice seemed a little weak but when you’re singing a song written for Tarja Turunen’s voice very few are capable of living up to Tarja’s performance. Overall though Floor sounds great tonight. Nightwish really are a fantastic live band and playing arenas means they can bring the sort of stage show that their music deserves. UK fans can expect some fantastic shows in December.